Spot the "moderate." 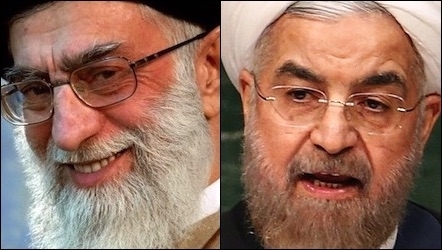 Hassan Rouhani (right) was hand-picked as Iran's president by Supreme Leader Khamenei (left). Moderate Iranians exist, but a genuine moderate within Iran's government cannot exist. Khomeini was careful not to run afoul of the Koranic prohibitions against "making partners with Allah" (in Arabic, "shirk"), so he came up with a solution. He formed the velayat-e faqih (rule of the jurisprudents) which, according to Christoph Reuter, is "a dictatorship of clerics." This arrangement allowed Khomeini to rule under the pretense that he was protecting Iran and all of Shia Islam until the return of the 12th Imam, who went into hiding in the 10th century. To ensure that the clerics could not challenge him, Khomeini created for himself the title of rahbar (supreme leader). According to terrorism expert Matthew Levitt, a 1986 U.S. Intelligence report on this system states that it "virtually equates Khomeini with the Mahdi -- the 12th Imam." Iranian officials who don't live up to the Supreme Leader's expectations are impeached or killed.